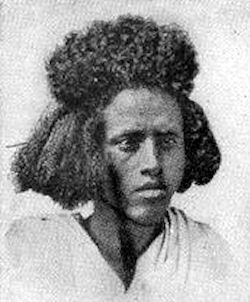 The Beja people are descendants of the legendary so-called Fuzzy-Wuzzies who, in 1885, defeated a British expeditionary force attempting to rescue General Charles Gordon, the British Governor General of Sudan in Khartoum. Their crown of fuzzy hair (tiffa) has characterized the Beja for centuries. Their ferocity as opponents was immortalized a century ago in the verse of Rudyard Kipling as the "Fuzzy-Wuzzy", fearless and worthy enemies of the British, who fought with spears against machine guns. Formed in 1952, during a period of relative political freedom in Sudan, the Beja Congress was intended to counter the long-standing disenfranchisement by the ruling center in Khartoum. The organization is structured along traditional lines; its leadership is elected from among ranking sheikhs or prominent Islamic religious leaders in the community. The political wing of the Beja Congress was formed to voice grievances against marginalisation of the region, but, frustrated by a lack of progress, began an armed struggle by the 1990s. The Beja Congress was a sub-group of the insurgent National Democratic Alliance, and is a signatory to the NDA's 1995 Asmara Declaration. The Beja Congress has suffered internal tensions between the radical leadership of Sheikh Omar and that of Sheik Suliman Betay supported by traditional groups interested in dominating eastern Sudan. The attitude of the Government of Sudan towards the Beja can be explained by political developments in the region in general and the Beja in particular. The different fractions of Sudanese opposition opposing the Khartoum regime were at one time operating from the Eastern Sudan border with Eritrea, an area which is dominantly Beja. The Beja after long periods of suppression decided to take arms and revolt against this situation. Demanding economics and political rights. Consequently, the GOS reacted aggressively and indiscriminately against the whole Beja population in Sudan. The non-Arab Beja tribes complained they were being marginalised and that their region is left to poverty and neglect. Beja frustration reached new heights in the 1990s when Khartoum aggressively promoted its version of Islam in the region, launching army attacks on Beja mosques and religious schools. 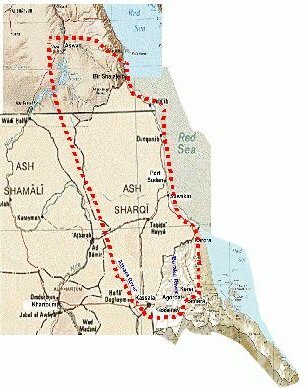 The Beja Congress effectively controlled a swathe of eastern Sudan centered around Garoura and Hamshkoraib. The Beja Congress took up arms against Khartoum in the early 1990s and was an important member of the NDA. Beja troops reportedly operated alongside other NDA members in various sectors and bring important influence with their ability to conduct small-scale mobile guerrilla operations based on intimate knowledge of the terrain; to provide access to other NDA forces; and to mobilize militia-type forces when needed (assuming the availability of weaponry). Given their mobility, the Beja are difficult for Khartoum's troops to pin down in a military sense. It was difficult for outsiders to distinguish military from nonmilitary personnel. On 02 May 2000 it was reported that the Beja Congress had sabotaged the export oil pipeline to the port of Bashir. But the stored oil reserves in Bashir was sufficient to prevent interruption of exports. Sudan's stated media claimed that the damage to the 1,000 mile pipeline, inflicted at a point some 345 miles north of the capital city, Khartoum, had been repaired. This incident was the third time since August 1999 that the pipeline had been sabotaged. The Beja Congress campaigned unsuccessfully to take part in negotiations in Kenya between the government and the SPLM/A, which were expected to lead to a peace agreement in January 2004. They rejected a deal on security arrangements signed by the two sides in October 2003, and shortly afterwards limited skirmishes resumed in the east after a break of several months. Military communiqués were issued in Asmara, capital of Eritrea, by the Beja Congress and the National Revolutionary Movement, claiming that on 14 October 2003 they attacked Tandalai Camp near Kassala, capital of the eastern region of the Sudan bordering Eritrea. 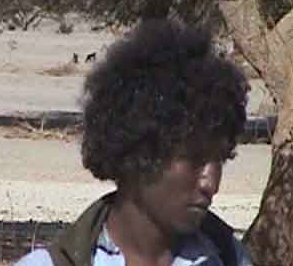 Sudanese authorities charged that Eritrea sponsored an effort to unify the Beja forces with another eastern Sudanese opposition faction calling itself "the Free Lions," made up of the Arab Rashaydah nomadic tribes. The rebel movement in the Darfur region of western Sudan, the Sudan Liberation Army (SLA), forged an alliance in mid-January 2004 with the eastern rebel group, the Beja Congress. A joint declaration said both parties would "continue their struggle together until they get rid of marginalisation, poverty, ignorance and backwardness." The Beja Congress is struggling for a federal arrangement for the region here in eastern Sudan where the people can govern themselves. And the Darfur people are also struggling for the same objective, that is a federal arrangement within a united Sudan. The Eastern Sudan Peace Agreement [ESPA] signed with the government of Sudan in October 2006 ended the insurgency and provided for the reintegration and rehabilitation of excombatants. In general elections in April 2010, the Beja Congress, formally allied with the ruling NCP since 2006, won only one seat in a local assembly in Red Sea State and none in the National Assembly in Khartoum. Anger at perceived manipulation of the elections compounded frustration over the slow implementation of the ESPA. The national secretariat of the Beja Congress in October 2011 decided to withdraw from the East Sudan Peace Agreement (ESPA) detailing the reasons which led to their considering the agreement as null and void. The Beja Congress announced in November 2011 that they had joined the Sudan Revolutionary Front (SRF), a newly formed alliance of armed opposition groups in the country since November 11. It comprised Sudan People's Liberation Movement-North (SPLM-N), Justice and Equality Movement (JEM), Sudan Liberation Army-Abdul Wahid (SLAAW), Sudan Liberation Army-Minni Minnawi (SLA-MM) apart from the Beja Congress. A statement issued by the Beja Congress said that its decision to join would help restore human dignity in Sudan in general and specifically with respect to the Beja minority. The Beja tribe are a culturally distinct and long-organized pastoral people who more closely resemble, in military terms, a people's militia than a guerrilla force. They are made up of ten distinct tribes occupying the north and east of Sudan numbering approximately 3,000,000-3,500,000 people. The Beja region extends from Aswan, Southern Egypt, in the North up to the Eritrean plateau and the plains of Massawa in the East and along the coast of the Red Sea into the Sudanese territories up to the Atbara area and along the Nile riverside as their Western borders. The Beja are widely believed to be descendants from the Hamiatic people of Asia who crossed the Red Sea and inhabited their current location some 4000 years BC. Traditional Beja beliefs mix Islam with fear of jinn, or evil spirits. The distribution of the Beja as one ethnic group in the areas of Southern Egypt, North-East and Eastern Sudan, and the Eastern and Western lowlands of Eritrea, and before the setting of the current political boundaries of these states, is confirmed through the tribes that constitute the Beja ethnic group. The Beja are divided into 10 distinct tribes namely El-Artega, El-Bushareyeen, El-Amar-er, El-Ashraf, El-Kemailab, El-Hedandawa, El-Melhetkanat, El-Habab, El-Halanga and El-Beni-Amir. The Beja of the Sudan occupy an area that extends from Halayeb in the Northeast along the Eastern borders of Sudan up to the Atbara river, and are bordered from the West by the river Nile. Their main population settlements are Halayeb, Tokar, Mohamed Goal, Hamash Koraib, Sinkat, Port Sudan, Karora and Kassala. The population of the Beja of the Sudan is estimated to be three million people. The region of the Beja lies just above the (600) isohyet with rainfall ranging between 500 mm in the Southern parts, to 0.0 mm annual precipitation in the Northern areas. The coastal areas receive the winter rains between November and January in the range of 150-200 mm. The land is mostly bare and rocky with few scattered xerophyte vegetation namely Acacia ssp., Ziziphus spina christie, Prospis chilensis, and some wild cactus ssp., seasonal grasses are associated with the rainy seasons. The terrain is generally rough, mountainous and is crossed with a multitude of dried and seasonal rivulets. The Beja land is also crossed by two major rivers, Gash and Toker both bringing water and fertile soil from the highlands of Ethiopia and Eritrea, thus, their respective deltas and flood plains are considered to be among the most fertile schemes in Sudan. The climatic zones of the Beja areas thus, vary from dry savanna in the Southern parts, to a typical desert zone to the far North. It is generally characterized by very low temperatures during the night, and extreme hotness during the day. The Beja tribes are mostly pastoralists with some of them practicing agropastoralism. Their pasture land and routes extends, as indicated by one of them, from Halayeb in the North-east of Sudan to the mountains of Rura Habab in the Sahel province of Eritrea. Their livestock consist mainly of camels and goats, which best suit the tough environment of the region. Farming is practiced at various levels along the pasture route as a supplementary activity. The Beja in Sudan are divided into five major tribes and many smaller subtribes, speaking several languages. On the Northern end in Aswan and South are the Ababda and the Bisharin. Somewhere in the middle and especially in Kassala and Port Sudan are the largest group, the Hadendowa and their smaller neighbors the Amarar. In the extreme south are the Beni Amir. The Beja of eastern Sudan have been neglected by central governments for decades, leaving them vulnerable to malnutrition, famine and disease. The nomadic pattern of the Beja, which necessitate a continuously mobile pattern of living characterized by the non-existence of permanent settlement forms - in most cases, has had its clear implications and consequences, historically, on the development of this ethnic group and that of the area they inhabit. This lifestyle has led to an underdevelopment of adequate infrastructural services such as health, education, . . . etc. This state continuously maintained by environmental pressures necessitating migrations in search of water, pasture, and farming lands, the aspect that put the Beja in a historical dialectic and a vicious circle of poverty, underdevelopment, and high vulnerability to external environmental elements. The present suffering of the Beja people is a result of a long process of deprivation and marginalization which has characterized the contemporary history of this group. This has been mainly due to successive mal-policies adopted by the various governments in Sudan which have neglected and overlooked the existence of the Beja, and possible negative impacts and adverse effects of these policies on their survival. Such policies include taking of vast grazing areas and their conversion into agricultural schemes, forcing the people to move with their animals into poor grazing land, mostly mountainous, areas of the Red Sea coast. The Gash and Tokar agricultural schemes stand as a conspicuous example for such depriving policies. Both schemes had taken land which was vital for the Beja in terms of resources and pattern of their economic activity. These areas used to provide the Beja with good pasture land and water for their livestock in their seasonal migration from East to West. Other plantation schemes in the Eastern region as a whole have also sprung up using intensive mechanization and taking large areas which were once a resort for the nomads and their animals. The horticultural gardens occupy all the land around the Gash river. The remaining areas, resource poor as they were, have also been used for building of roads such as the roads connecting the capital Khartoum with Port Sudan, coupled with the recent ongoing war and the economic decline nationwide, have aggravated the situation even more. Thus, the end result is a loss of wealth and impoverishment of the Beja people as well as accelerating environmental degradation and desertification. Both the land and its people have suffered tremendously from such mal-policies adopted by the different groups that have come to power in the contemporary Sudan. Some studies carried out in the area described a previous situation where animals were traded for sorghum and other consumer goods, and agriculture was also practiced along the seasonal wadies and khores. This practice no longer exist, the loss of natural pasture land combined with the drying-up of wells in the area, and the resent droughts have all led to the loss of livestock and the decrease of nomadism in the area. Accordingly, the area witnessed a large influx of rural people into the urban centers especially during the famine years of 1984, 85, 90, 93 and 1996. Large scattered settlements started to emerge around these urban centers indicating the magnitude of poverty and displacement that have since taken place within the Beja. Poverty, disease, hunger, illiteracy have all been permanent and persistent phenomenon and is characteristic of the Beja life during the last years.